“She’s got it bad, and he ain’t good — he’s in her garage? Special thanks to Scholastic and NetGalley for providing me with this eARC. 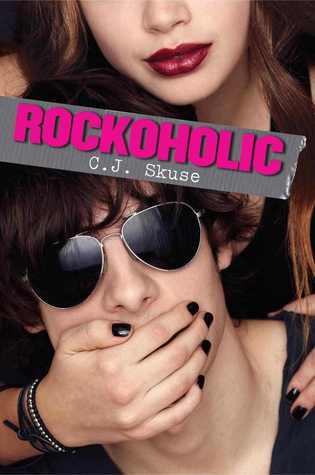 You can get your own copy of Rockoholic when it comes out on November 1st, 2012. What girl hasn’t thought about meeting her favorite rock star? But what girl actually kidnaps her favorite rock star? Not that Jody was planning to. It’s just that when she meets Jackson (frontman of The Regulators) backstage and thrusts out a Curly Wurly (a chocolate bar) to offer him, he’s so drugged up that he thinks the Curly Wurly is a knife and that she’s kidnapping him. Jody, of course, plays along and stashes him in her garage. But Jody gets more than she bargains for when she discovers that the drugged-up, spoiled, jerky, rock star doesn’t want to leave her garage. My favorite part of the story has to be when Jody pushes Jackson off a bridge (don’t worry! He lives.). Jackson was being a major jerk and insulting Jody, and I just really liked that even though Jody idolized him for so long, she wasn’t going to stand there and take his insults. True, she went over to talk him out of jumping off the bridge, instead of pushing him in; but I’m still happy that Jody didn’t let Jackson get away with being mean to her just because he was famous. I also enjoyed that this story was set in the U.K. and used a lot of phrases from there. This book had such a great premise, but the whole thing kind of fell flat for me. For one thing, I found Jody very immature and annoying and Jackson extremely irritating, even though they did both grow into better people by the end of the novel. I also felt that the story dragged out in some places. Yes, I think it’s great that more issues were explored and that Jody got to feel the consequences, it’s just not the funny, wild romp I was expecting from reading the book description. This sounds like a great book! My kids, husband and I like to read the same books; it’s like our very own little book club. We just finished reading a great book called “The Gilded Butterfly” by Sergei Selivanov. You can check out the book and get it right off the website, http://thegildedbutterflypage.com/index.html. I’ll have to suggest this one to my family, I think they’d really like it! Thanks for the post and the suggestion! Great review! I got this from netgalley but still haven’t read it… the premise sounds really funny though!